World Cup hero Sir Geoff Hurst has urged England’s Euro 2016 youngsters to forget inexperience and fulfil their promise – just as Alf Ramsey’s team did 50 years ago. Hurst and three other 1966 world champions – Gordon Banks, Martin Peters and George Cohen – gathered at the Royal Garden Hotel in Kensington this week to launch this year’s 50th anniversary of England’s one and only major triumph. The hotel hosted the tournament’s draw half a century ago and was also the venue where the team celebrated the night of their momentous win over West Germany. Hurst scored a hat-trick and Peters was also on target in the famous 4-2 victory. England have reached only one World Cup semi-final since but optimism is growing around a new generation of talent, with Dele Alli, Harry Kane, Ross Barkley and John Stones all impressing this season. Hurst is excited by the emerging crop and says they only to need look at his 1966 side to see experience does not always equal success. “We are starting to see in my opinion a greater number of quality players getting through to the national side,” Hurst said. “We have got to continue that but we have got to produce. The young players, as in our time, have got to grasp the opportunity. “You look back to us. Alan Ball was 21 – the man of the match in the final. We knew he was man of the match. Mooro (Bobby Moore), 93 per cent passes. Martin Peters didn’t play until May – two months before the final – then scores a goal in the final. Hurst scored 24 goals in 49 international appearances and remains the only player to score a hat-trick in a World Cup final. The former West Ham striker was asked if he would get into the current England side and he was unequivocal in his response. “What a stupid question! You’re kidding aren’t you?” Hurst said. “Of course I would. Would I score more goals? Yes. They say it’s tougher today, I think that’s nonsense. 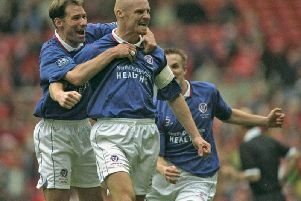 Hurst added: “You look back at some of those archaic matches from the 60s and 70s, the villainous teams, the Chelsea against Leeds 1970 FA Cup final, the Vinnie Jones era – it was astonishing. “It was different rules and regulations. “Some of our era could play today, I’m not sure some of today’s era with the rules and regulations could survive in ours.